Anisacanthus quadrifidus var. wrightii (gold) - Gold Hummingbird Bush - Perennial - Very drought-tolerant, for sunny sites, grows to 4' high by 6' wide and can spread by seed. Anisacanthus quadrifidus var. wrightii (red) - Red Hummingbird Bush - Perennial - Very drought-tolerant, for sunny sites, grows to 4' high by 6' wide and can spread by seed. Anisacanthus puberulus - Formerly Anisacanthus insignis var. insignis - Pink Hummingbird Bush - Shrub - A woody ornamental to 6' high and 8' wide. Drought-tolerant and does best with afternoon shade. Dicliptera suberecta - Mexican Honeysuckle - Perennial - Neither Mexican nor a honeysuckle. 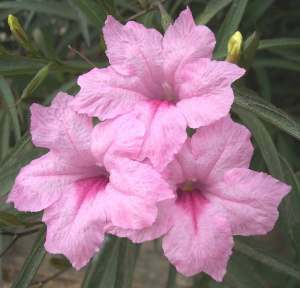 A 2' to 3' high native of Uruguay for sites receiving at least 4 hours of sun. Very drought-tolerant once established. Justicia californica - Mohave Honeysuckle - Perennial - Tall (to 4' high) and spindly. Best in a wild garden to attract hummingbirds. Sporadically produces red flowers from spring until first freeze. Very drought-tolerant once established. Justicia fulvicoma 'Sierra Flame'™ - 'Sierra Flame'™ Justicia - Perennial - Produces pagoda-like spikes of orange-red bracts from spring until first freeze. Very drought-tolerant once established. Does best with shade in late afternoon. Justicia runyonii - Perennial - Produces purpish-pink blooms over a long season. Does best with afternoon shade. Justicia spicigera - Mohintle - Perennial - Grows 2' to 3' high and bears orange flowers summer and fall. Grows in sites receiving at least half-day sun. Yields a fabric dye and is used medicinally in Mexico. Megaskepasma erythrochlamys - Brazilian Red-Cloak - Tender Perennial - An outstanding winter flowering ornamental for a greenhouse or conservatory. Ruellia brittoniana 'Blanquita'™ - Dwarf White Mexican Petunia - Perennial - Like all the other Dwarf Ruellias, this clone can grow with as little as one hour of sun per day to all day sun. Very drought-tolerant once established. Few perennial groundcovers are as adaptable or as prolific. Plant 3 feet on center, cover soil with 2" of shredded hardwood mulch and have a full bed in less than 3 years. This beautiful plant is like the barbarians ululating at the gate or the mongol horde galloping across the barren steppe, it is an invader. While it is not for the tidy flower border, it is suitable in so many locations. I use it (as well as the related white or purple flowered forms) at the wild margins of landscapes. For example, it will provide months of carefree color on a rocky and shady slope where deer abound. Also, Ruellias are ideal perennials for those parking lot plant islands mandated by the horticultural morons at City Hall, that are generally populated by drought-stressed and heat-exhausted plants. Grows up to 3' high and bears ephemeral pink flowers from April until first frost. Very drought-tolerant and needs at least 4 hours of sun each day. Ruellia brittoniana 'Nolan's Dwarf' - Katie Ruellia - Perennial - 'Nolan's Dwarf' is the original, valid cultivar name for this clone.